Posted on September 1, 2017 at 9:00 am. Air conditioning systems in our homes and even offices are one of the most neglected parts of the vicinity. As long as they’re running, they seem good enough even though they may not be running with full efficacy. Air conditioning service in Chattanooga, TN is a great help for the residents due to the large number of failure problems arising in air conditioning systems. You don’t want to wait around until something malfunctions and the entire system shuts down completely with no choice left but to call in professionals for air conditioner repair in Chattanooga, TN. We need to be more attentive to our air conditioning systems and develop an eye for detail too. If you pay attention to your air conditioner, you might notice small strands of dust accumulated along the vent. From time to time, small portions of this debris flow out along with the temperature controlled air that the system produces, polluting the indoor environment of your home or office instead of cleaning it. There are numerous things that can go wrong with an air conditioning system because it is a whole system and not a mere component which means that the overall performance of your air conditioning system is dependent upon the compartmentalized function of each and every component that altogether forms the system. If any one of these components fails, it’s just a matter of time before your air conditioning systems stops functioning. It’s always a good idea to have professionals run your air conditioning service in Chattanooga, TN. Sound familiar? Often times turning the air conditioning on does not really make a difference because it is not really getting rid of the humidity from the room and cooling it, which is what it is normally suppose to do. If this is the case, check out the two copper pipes in the system. If the large one feels cold upon touching, then your system is alright. But if not, you better call up professionals for air conditioning repair in Chattanooga, TN. Inability of the condenser fan to rotate properly and dispense the air appropriately results in a longer time to cool the room because the air isn’t distributed evenly, thanks to the dysfunctional fan. This could be because the fan might have burned out and needs replacement and air conditioning repair in Chattanooga, TN can help you with that. A haunted house isn’t the only explanation to a frequently switching off and on air conditioner. There is probably something wrong with the condenser or the evaporator in the air conditioning system. Whatever it is, air conditioning repair in Chattanooga, TN will take care of it for you. There might even be obstruction in the system which is what usually happens. 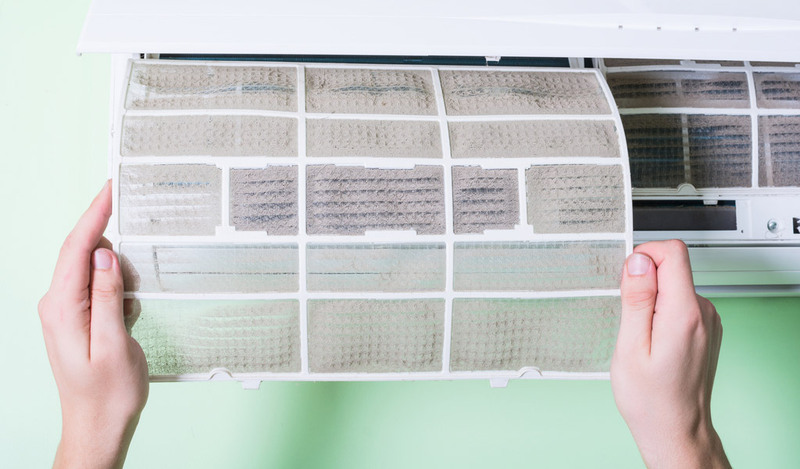 Dirty filter: This is one of the most common problems in air conditioning systems not just in Chattanooga, TN but all over in general. The filters trap up any particulate matter and dust that would have flown out and quite possibly breathed in. However, over some time, these particles clog up the filter and restrict the airflow, thereby reducing the air conditioning system’s performance. Therefore, monthly cleaning of the air filters is strongly recommended. Air leaks in the room: If your air conditioner isn’t cooling up the place or is taking too long, you need to check the room for cracked windows and make sure the door is closed too because there might be warm air leaking in. Sometimes, it’s the window seal around the unit that serves as an inlet of warm air. Getting your system regularly serviced by professionals in air conditioning service in Chattanooga, TN will make sure no such errors prolong. The television might be too close to the air conditioner: You might be over working your air conditioning system because the television or other electronic appliances might be placed too near to the thermostat and the thermostat might be inaccurately detecting the heat from these appliances and running longer unnecessarily. Wrong settings on the thermostat: People of Chattanooga, TN are busy folks and often don’t manage the thermostat very well. Turning the thermostat to the desired temperature would not magically flip the temperature instantaneously. It will take a while before the rooms reach the input temperature. Programmable thermostats should be set to a temperature that’s comfortable to the residents. Here’s a pro tip: Always set the temperature a bit higher before leaving the house. This will this save money on the energy bill (since every degree raised will save 3% on the air conditioning cost) and since no one is home to acclimatize, it is okay if the central air conditioning unit takes a bit longer to cool the place. You’re letting in too much sunlight: If sunlight entering the room through any of the windows happens to land on the thermostat, it will register the wrong temperature and the error will be carried forward along the system. Also, if your air conditioning unit is in a sunny window, not only does it have to work harder but is also at risk of overheating. So, be liberal with the drapes and shades in the room. Taking necessary maintenance measures that ensure the proper functionality and performance of your air conditioning system is a task that requires a bit of diligence and common sense from our end. Enough reason to call in air conditioning service in Chattanooga, TN. Regular servicing of your air conditioning system will not only keep you at ease, but will also ensure that any problems in the system are nipped in the bud instead of developing into a bigger issue and costing you big bucks.